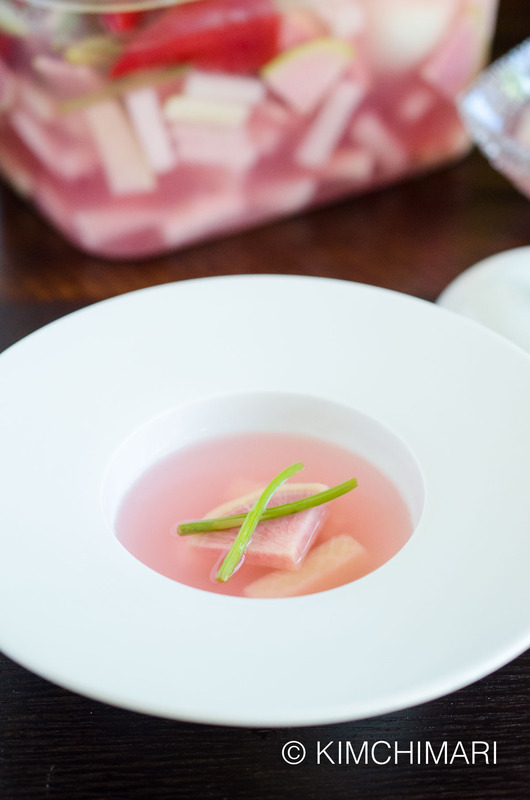 WATER KIMCHI may not really sound appetizing but it is absolutely refreshing and delicious. Water kimchi really doesn’t involve a lot of ingredients but it comes out so fabulous – so refreshing and belly cleansing deliciousness. 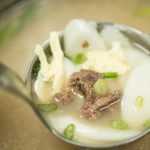 There’s a phrase that Koreans use to describe a taste sensation like this – “속이 확 뚤린다” – which basically means it feels like my stomach is totally clearing. I guess a similar feeling would be how you feel when you drink sparking water or any bubbly drinks. You can feel it reach the deep area of your stomach in a very clearing way. 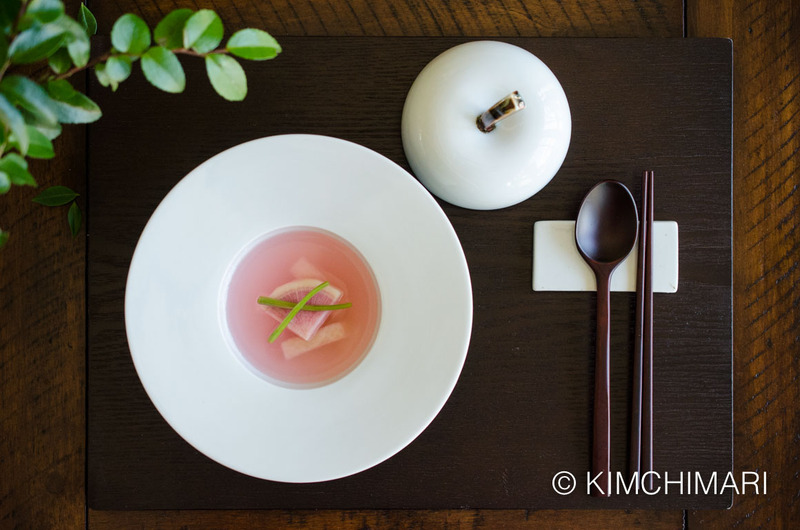 Korean Water Kimchi (mul kimchi 물김치) is traditionally served as part of a Korean meal as banchan (side dish) but recently, especially in more fancy restaurants, they are served almost as apértif – as a way to stimulate your appetite. 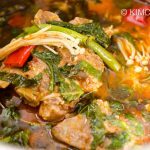 Served as part of a meal, I feel it acts as a way to cleanse your palette in between heavily fatty or spicy dishes. OH! OH!! NEWS FLASH!! I have just uploaded my very FIRST recipe video!! I am not 100% happy with it but it’s my very first one so hope you are going to be gentle with me about it… 😍 Video is at the very end of this post. 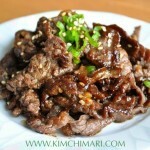 Before we go onto the recipe, I want to clarify exactly what Mul Kimchi is. Because it’s actually a very general term and that includes many different kinds. First, “mul” literally means “water”. 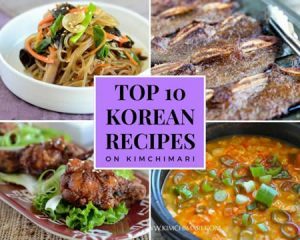 And according to the Korean Food Science and Technology Dictionary, Mul kimchi has radish and Korean napa cabbage as its main ingredients but can have many other vegetables. It is made by adding lightly salted brine that is not spicy. So I have to say, my Water Kimchi recipe here is sort of in between a Dongchimi and Nabak kimchi but is probably the most popular version in modern Korean cuisine because it is simple to make and yet captures the best flavors of Mul Kimchi. 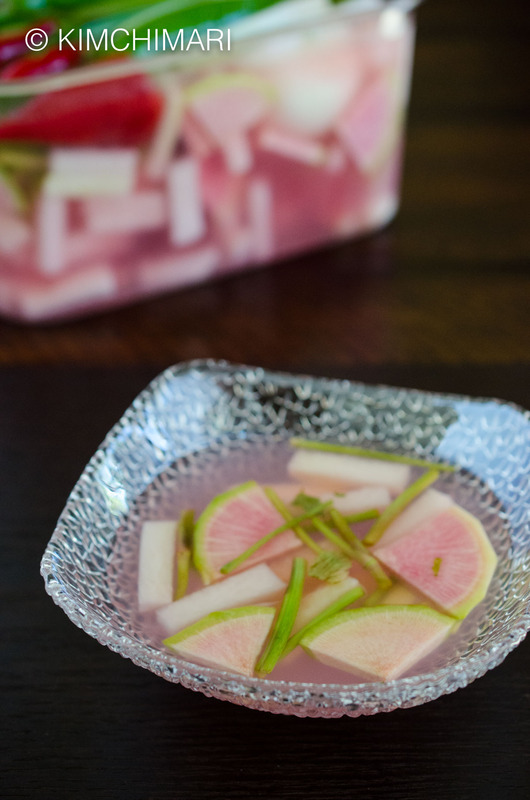 Now, normally, the liquid of Korean water kimchi made with radish is colorless but I decided to go a little different and added watermelon radish for some pretty color. And boy, was I glad I did!! 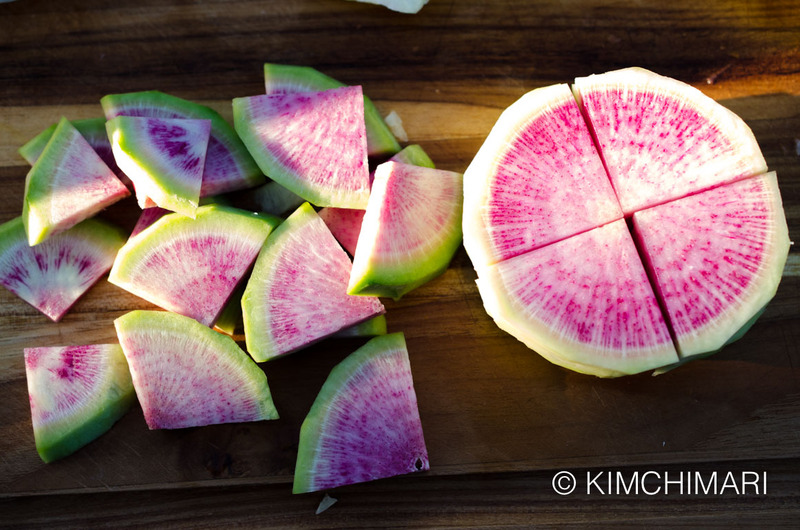 The color came out such a pretty pink and the watermelon radish tasted quite crunchy and delicious too! I LOVE this recipe. 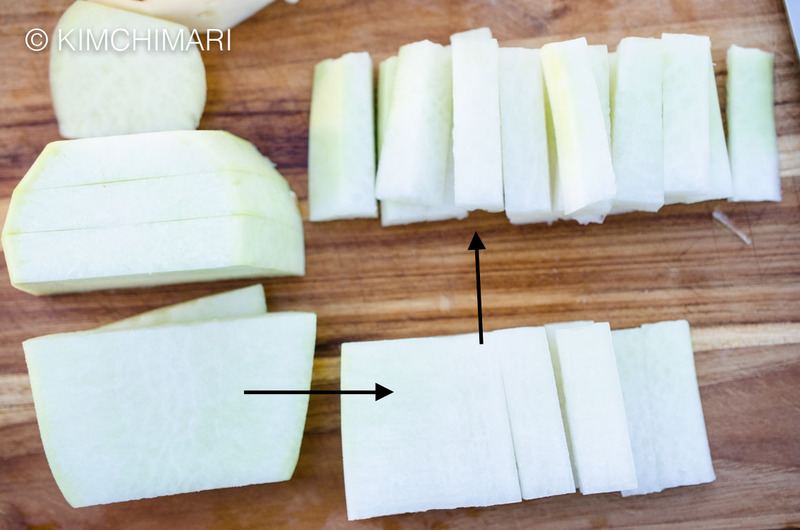 Peel and cut Korean radish into 1.5 in (1.75 cm) thick chunks –> cut each thick round chunk vertically (left in pic) into 0.5 in (1.2 cm) thick slices –> and then each slice into 0.5 in (1.2 cm) thick batons (right top). Core 1/2 of a Korean pear and peel and cut 1/2 yellow onion. Wash and cut water dropwort into 2 in (5cm) lengths. Discard the very leafy parts on top and also the bottom thick stems that are too fibrous (like cutting off the thick stems off of asparagus). Wash and take off stems from green and red chili peppers. 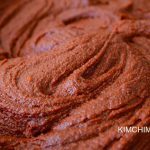 If you cannot get Korean chili peppers, you can substitute them with other mild chilis such as the red Piquillo de Lodosa peppers I used here. 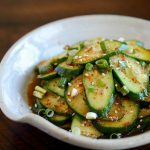 Jalapeno peppers can also be substituted but since it is a bit spicier than Korean ones, you may want to use a little less. Prepare 2 thick fresh ginger slices and 6 cloves of fresh garlic. 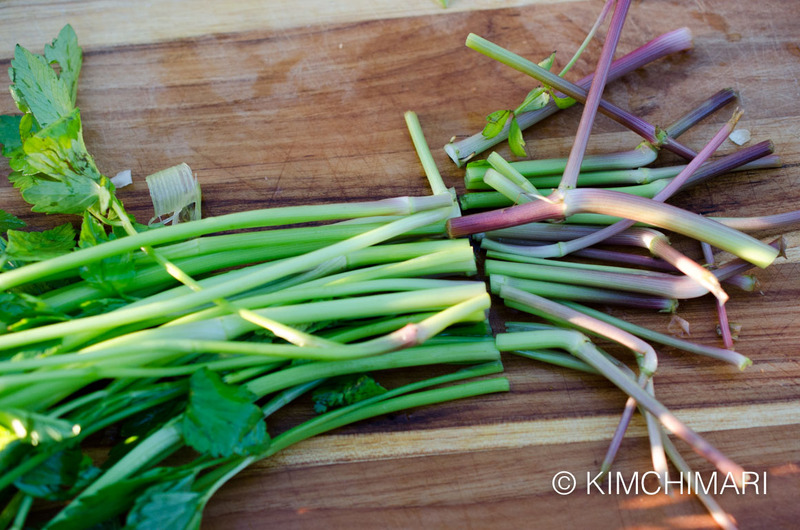 Cut green onions into 1/2 lengths. 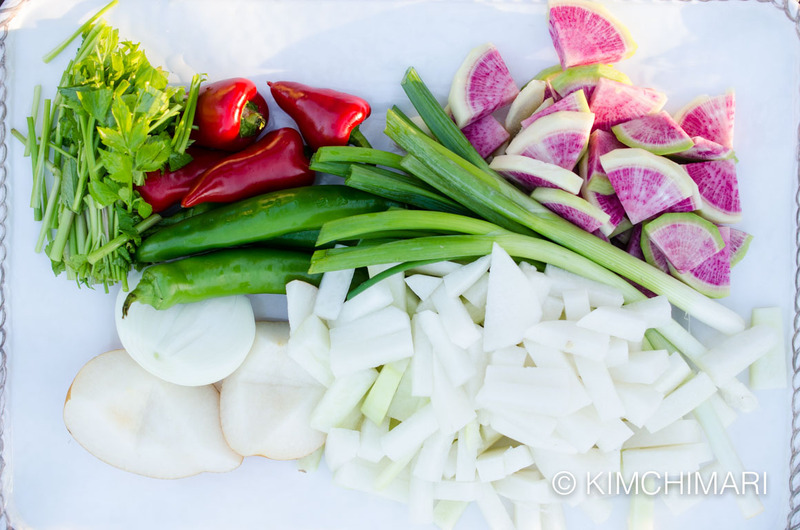 And here’s all the ingredients you need to put in your Water Kimchi (Mul Kimchi). Oops – forgot to take the stems off of the chili peppers in this picture…sshhh..
Place all of the ingredients in container in no particular order but would be good to have the bigger items like pear and onion at the bottom. Mix 3 Tbsp + 1 tsp Korean solar seal salt (Cheonilyeom) and 2 Tbsp sugar in 2 litre (0.5 gallon) water. Stir until everything is well dissolved. Pour salt sugar water on top of the Kimchi ingredients prepared in 7. That’s it!! Our water kimchi is now ready for fermentation. LEAVE at room temperature for 1 day. On a HOT summer day, you may want to put in the fridge sooner. Refrigerate for 2-3 days and it will be fabulous!! As it ferments, you will taste somewhat of a fizzy taste which is just so awesomely refreshing. This is water kimchi on day 4 – straight from the fridge. SEE THE PRETTY COLOR! At time of serving, add 1/2 tsp sugar or more to taste per 1 cup of water mul kimchi. 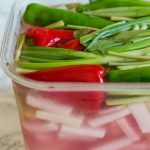 Korean water kimchi really doesn’t involve a lot of ingredients but it comes out so fabulous – so refreshing and belly cleansing deliciousness. 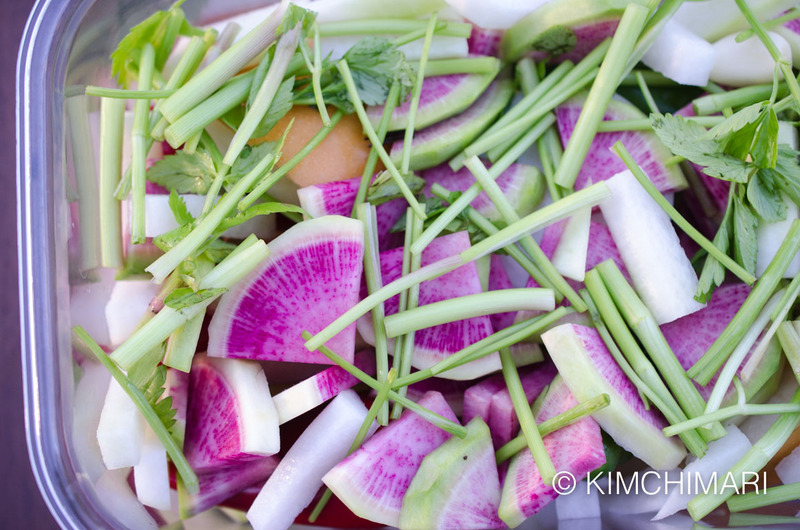 Peel and cut watermelon radish into slices (approx 1/4 in or 0.5 cm thick) and then into quarters. Wash and cut water dropwort into 2 in (5cm) lengths. Discard leafy parts on top and also bottom thick stems that are too fibrous. Wash and take off stems from green and red chili peppers. Prepare 2 thick fresh ginger slices and 6 cloves of fresh garlic. Cut green onions into 1/2 lengths. Pour salt sugar water on top of the Kimchi ingredients prepared in container. Water kimchi is now ready for fermentation. LEAVE at room temperature for 1 day. On a HOT summer day, you may want to put in the fridge sooner. Refrigerate for 2-3 days and it will be fabulous!! As it ferments, you will taste somewhat of a fizzy taste which is just so awesomely refreshing. Weight of my radishes (both regular and watermelon radish) was about 1 kg. 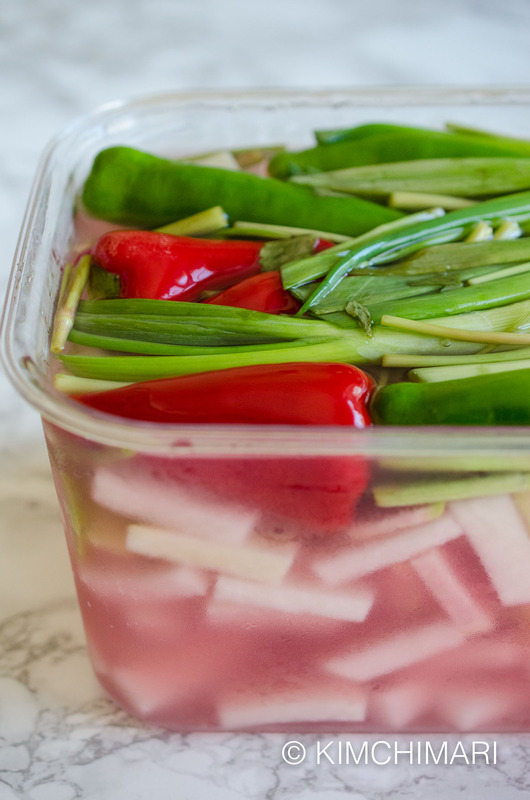 Water or Mul Kimchi is best served COLD straight from the fridge. You can also add 1-2 ice cubes right before serving. If you like things sweeter, you can add a little more sugar (1/2 tsp per 1 cup) right before serving. I made the recipe on the less sweet side so that you can adjust to your liking. Use leftover water kimchi liquid to make the most delicious cold soup for noodles. You can make naengmyeon noodle soup with it. Just add some beef or chicken broth to it. PLEASE use Korean Cheonilyeom Solar Sea Salt for Kimchi. 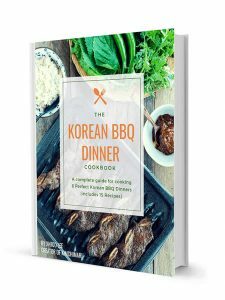 If you don’t have a Korean grocery nearby, you can find it online or find under Basic Korean Seasonings category in my Amazon store. If you are going to use other sea salt, please add to taste as they tend to make things more salty than Korean salt. Total weight of my radishes (regular and watermelon radish) was about 1 kg or 2.2 lbs. Use leftover water kimchi liquid to make the most delicious cold soup for noodles. You can make naengmyeon noodle soup with it. Just add some beef or chicken broth to it and season with vinegar, sugar and soy sauce. To add extra fizziness, sometimes my mom adds sprite or 7 up before servings. Probably 1-2 Tbs or so to each serving. This kimchi should last up to a month or so in the fridge – especially if you put it in the fridge a little early (leave at room temp only for 1/2 day instead of 1 day). 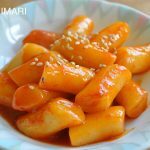 I’m growing 미나리 this summer, in part inspired by this recipe (which I love)! in my last batch, I didn’t have it, but added cubes of seedless cucumber (the kind with the really thin skin), extra pear (some peeled and cut into chunks — it’s so good and stays really crisp this way), extra ginger (I minced it and put it in a tea ball to flavor everything) and a bit less garlic. I love it! it settles my stomach like nothing else and is so delicious in this hot weather. the broth is the best part. my housemate likes to have this as dessert, though I really don’t make it that sweet! Oh wow! I never thought to grow 미나리 yet – I should. 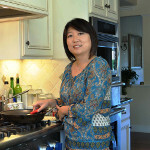 I am so delighted to hear that my recipe inspired you to grow them. I am sure adding cucumber will add extra flavor of freshness. 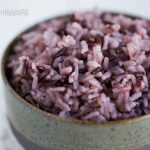 Yes, as I noted in the post, radish water kimchi had enzymes that help with digestion so you have it so right – it will definitely help with your stomach. 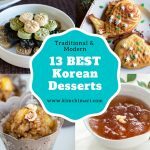 I love the story of your housemate enjoying water kimchi as dessert! How fun! Thank you so much Diane for sharing this. It just totally makes my day or night! haha.. Cheers!! Would it be ok to skip the water dropwort? I can’t seem to find it anywhere around here. Hi MK! Sure you can skip it. It does add a bit of extra flavor but you can totally make it without it. Good luck! During this hot spell, I have been thinking about this non-stop! The hardest ingredient to get will be the peppers, since they always come packaged as “way too many for one person.” also, it’s not clear to me – “Weight of my radishes (both regular and watermelon radish) was about 1 kg.” – each or together? I know what you mean.. I still have leftover peppers from making this. haha. And yes, I was not very clear – thank you for pointing it out. I meant, “together” in total, they weighed about 950g to be exact. Regular radish can be around a little less than 2 lbs or 900g or so and then the watermelon radish. Hope you get to make it soon! Thank you so much Sally! Let me know how it turns out for you! So it should still be good for up to a month as long as you put in the kimchi earlier in the fridge (like 1/2 day instead of 1 day) and let it ferment slowly in the fridge (so maybe 4-5 days instead of 2-3 days). I made my last batch about 3 weeks ago and it is a little on the sour side now but still good! Thanks so much for asking!